It was a beautifully sunny day in New Orleans, which meant it was hot, hot, hot, and I was almost instantly drenched in my own glisten after about a block. Yep, some good old fashioned summer bicycling! After an appointment and lunch and then another appointment I headed downtown to the gym, partly for the weights and partly for the air conditioning and cold showers. I was walking my bike along Magazine past the WWII Museum (yes, I predict that’s where I’m headed, now that I’ve finished the Civil War series…damn you, Ken Burns!) when I noticed these canvas drape-thingys on a chain link fence. 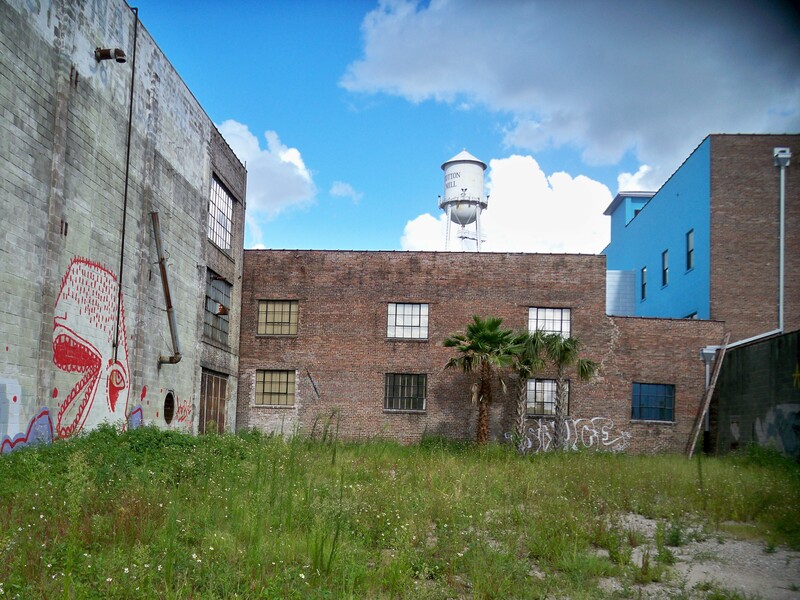 I peeked behind them and saw this empty lot with overgrown grass and weeds and those stunted palm trees and graffiti. No wonder they’re trying to hide it–it most surely doesn’t go with the whole “revitalized block” show they’ve got going on here. Funny, though, I thought with that blue sky, those clouds, the Cotton Mill, it all looked rather beautiful today. I snapped my photo through the chain link and got back on my bike, and continued on my way. This entry was posted in blight, graffiti, museums and tagged CBD, empty lots, graffiti, National WWII Museum, New Orleans, weather. Bookmark the permalink. love this photo, so glad you looked beyond the fence.